Welcome to the blog space for Black London Histories. This blog will record my process as I build a digital map of black London life, culture and politics, covering the period from the 1958 white riots in Notting Hill to the 1981 Black People’s Day of Action. The map is part of a project that I am beginning as a Leverhulme Early Career Fellow at the University of Sussex’s Department of History and Sussex Humanities Lab. My project aims to map out the material and mental spaces of ‘black London’ created between 1958 and 1981. I hope to explore what ‘black London’ meant and how it was experienced by those people who in various ways produced and lived through it, and to see how it was connected to the multiple planned or organic projects for the creation of an anti-racist, multicultural or cosmopolitan city. London became widely recognised as a new kind of multi-racial city in this period. As the city’s non-white population grew in size, it variously became a source of fascination, worry, hope and, frankly, hate, for many of the city’s white residents, and for local and national government. But at the same time black Londoners became an increasingly visible political and cultural force in the life of the city, and remade the city themselves. London did not become multi-racial in these decades, but it was in these decades that its multi-ethnic character was most charged in the city’s political and cultural life, and that this multi-ethnic character was most often read through the lens of race. It was in this period, too, that London’s ‘black’ neighbourhoods came into their own. 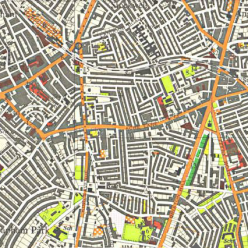 Brixton, Notting Hill, Hackney, Harlesden, Shepherds Bush, Finsbury Park: these areas became, for their enthusiasts and their detractors alike, symbolic neighbourhoods lodged firmly in a new racialised topography of the city. In this project, I am interested in where ideas of ‘black London’ came from, and how they were produced. How, for example, did Brixton become known as a ‘black’ district in the city, and by whom? What cultural forms and practices—literary, artistic, musical—worked to create an image of ‘black London’? What did ‘black London’ mean? Where was the ‘blackness’ of its identity seen most to reside? And how did its various sites connect up, if indeed they did? I am also interested, though, in the uses to which these ideas and experiences of ‘black London’ were put, how it was produced as a material reality, and how this material reality became a site of politics. How was London as a ‘black’ space managed? How did it become a part of particular cultural, political, social or economic projects, practices or policies? How did voluntary associations and local political movements attempt to speak in the name of black London, or to transform its character? What is the relationship between the emergence of ‘black’ city spaces in London and the development of anti-racist, multicultural and cosmopolitan formations? And how do these stand apart from or connect up to institutions of state, and local social and political networks? Ultimately, as I explain at the end of this short blog, I am interested in the relationship between the production and living of ‘black London’ and the development of politics of race, anti-racism, multiculturalism and cosmopolitanism. I also, though, hope to offer a resource for others interested in the historical development of black London. Part of my project here, as I indicated above, is the development of a digital map of black London between 1958 and 1981. This blog will be primarily dedicated to posts on the development of the map, exploring what black London life looked like in these decades, and what it meant. The map aims to provide a topography of black London which extends from its social and leisure sites, community and educational centres, political headquarters, and commercial enterprises, to key sites of protest, celebration, confrontation and conviviality, which marked out particular locations as symbolic nodes in the life of the black metropolis. The map will be live from early on in the project. I will be plotting it as I go, and aim to update it regularly to reflect the current state of my research. In the blogs here, I will elaborate on some of the significance of the sites I am mapping out, as well as reflecting on the progress of the project, and any points of interest or difficulty arising from it. Ultimately, once the map gets under way, I hope that others might also be able to contribute to its development, and in this way it might take on a life of its own. I will add a more detailed post about this in the future, but ultimately I hope that by making this map publicly available, it can also become public property, and a shared undertaking for anyone interested to begin plotting out their own memories and experience of the city, or the results of their own research. In this way, I hope that the map can come to plot the many and diverse black Londons of the 1950s, 1960s, 1970s and 1980s, and to help us think about how these did or did not connect up, and where each might be seen to stand in relationship to the multiple political projects of black London which also, as I discuss further below, make up the object of investigation in my study. So that is the map, and as I say, I hope it will take on a life of its own in time. But it is also a part of a particular project I am undertaking to understand the relationship between ‘black London’ as a mental and material space, and the development of black politics in the metropolis. I’ll discuss this for the remainder of the blog. We are perhaps over-familiar with a particular version of black London history, and particularly of black London politics: Notting Hill in 1976, say; or Brixton in 1981. As James Procter has argued ‘a highly territorial, politicised black identity came to be structured’ around London’s ‘black enclaves’ in the 1970s and 1980s, sites conceived as the authentic venues of black expression. From Linton Kwesi Johnson’s street poetry to Paul Gilroy’s accounts of ‘the dance-halls and clubs where the bass-heavy beat of the sound systems pumped righteous blood to the political heart of the community’, imaginations of black space through vernacular music cultures and street presence and protest are at the forefront of how black city life is remembered and commemorated. They overdetermine how we commonly encounter the history of black urban spaces as sites of political formation. This black London was indeed at the heart of many of the political projects to build an anti-racist black politics in the 1970s and 1980s. But the centring of these spaces and figures of blackness—the dancehall, the deejay and the dancer, or the street fighter—also works as a kind of erasure, a historical amnesia. It can too readily remove from view the other lives of black London, and other black Londoners, as well as making it harder to see how such spaces and actors connected up with the wider social formation and the state, and where they came from. As Stuart Hall wrote in 1984, looking back, in that decade of urban upheaval, on the photographs of Windrush migrants disembarking at Waterloo station in the 1950s and ’60s, such photographs ‘contradict our expectations’: ‘Why are they so formally got up? Why does everybody wear a hat? Why are they carrying their clothes in straw baskets? Where are the street fighters, the Rastas, the reggae?’. Black London is not, never was, just nightclubs and youths, or social uprisings, protests, and civil unrest. But these sites, these practices, and these actors, had become firmly centred in popular conceptions of black London life by the time Hall was writing, in 1984. The black London of black protest, seized hold of by those black radicals of the 1980s whose writing has dominated how we come to think of that decade, came into its own in the clashes between youth and the police at the Notting Hill Carnival in the late 1970s, and in the urban uprisings of the early 1980s. But these years also witnessed other mass political mobilisations in the name of black politics, most powerfully in the Black People’s Day of Action, a 20,000-strong march from New Cross to Westminster to protest the deaths of thirteen black teenagers in a suspected arson attack on a New Cross house party in early 1981. Among the marchers here were many different black Londoners, of all ages and political persuasions. My project is interested in the development of black politics in London, but I want to know how this worked as a multiple, contradictory, contingent reality. What routes brought these people together in the name of a black politics? And how did they understand and stage the claim they were making on the city, or demanding that the city recognise? In other words, how can we better understand the development of black politics in the city by both explaining and moving beyond beyond the focus on youth culture, vernacular spaces, and non-state political action? By mapping out black London social, cultural and political life, the project I’m beginning here hopes to help us to understand the relationship between London’s cultures of blackness and the development of black politics in the city. The scale of black political mobilisation in the city between 1958 and 1981 is significant, and the mass protests of 1981, both those organic uprisings of the summer, and the organised march of the Black People’s Day of Action, are particularly important. Just as importantly, though, various smaller-scale social and political projects developed throughout this period to confront structures of exclusion, inequality, and racial terror. These repeatedly spoke in the name of, or attempted to confront and negotiate the meaning of, black London. Black London both as an idea and as a produced material reality, in other words, held a central place in the development of the various anti-racist, multicultural and cosmopolitan politics of the city. Historians associated with the Modern British Studies project at the University of Birmingham have productively urged us to return to questions of democratic participation in Britain’s age of mass democracy, exploring processes of enfranchisement and disenfranchisement from ‘the ballot boxes’ to ‘questions over who could and could not participate in diverse forms of everyday life, and the different and unequal modes and speeds of participation in social, cultural, economic and political life’. As scholars working on the history of race in Britain are making increasingly clear, what Bill Schwarz some years ago termed the ‘re-racialisation’ of English life in the 1950s and 1960s had a deep structural impact on how social, cultural and political life in Britain was organised: in short, all were produced through and reproduced racialised logics. And race became ever more firmly entrenched in political, social, economic and cultural structures, ordering social experience from the institutions of state to the intimacies of everyday life in the following decades, as we know through the pioneering work of Stuart Hall, Paul Gilroy and others at the Centre for Contemporary Cultural Studies working in the 1970s and 1980s. Black Britons negotiated many and varying forms of racialised exclusion in their day-to-day life in the city. Through electoral politics, mass demonstration, social uprising, social welfare projects, community development projects, and many other means, they forced the changes in enfranchisement and participation which today we recognise as the multiculturalisation of British life. Stuart Hall, explaining the changes of multi-ethnic Britain in the second half of the twentieth century, referred to a process of ‘creeping multiculturalism’ or ‘multicultural drift’. This drift was, and is, uneven; and it was, and is, far from inevitable. ‘Large tracts of the country, most significant centres of power and many so-called “ethnic minority” people’, as Hall reminded us in 1999, ‘are largely untouched by it’. In drawing our attention to this process of multiculturalism and its limits, though, his aim was precisely to ask us to consider the ‘cultures of democracy’ that currently pre-occupy researchers from the Birmingham Modern British Studies project. Hall’s description of multiculturalism as a process of ‘drift’ is, really, an indictment of national government and agencies of state in planning for and attempting to deliver multicultural inclusion; it is not a way of signalling a chance occurrence, or inevitable natural development. This multicultural drift, as Hall elaborated in a 2005 interview with Les Back, is the result of struggle, but a struggle largely conducted outside and against the central institutions of state. This struggle was often quotidian, far from the domain of what is usually understood as the political. It was also the ordinary, mundane business making up what James Procter has called the ‘postcolonial everyday’. But it connected up with, and was often facilitated by, the organised political projects that also aimed to speak in its name. As Hall reminded Back, ‘I don’t mean that there’s nothing to multiculturalism but its drift. Without anti-racist politics, without the resistance to racism at the local level, without a change of consciousness among black people, no multiculturalism of any kind’. In this project, I hope to explore the connection between these politics and the more quotidian processes by which, as Hall says, ‘black and Asian people’ became an ‘increasing visible presence … in all aspects of British social life’. One of the most potent symbols for organising and producing these changes in British social and political life, and for challenging and attempting to dismantle those racial logics which have gained ground since the 1950s, was ‘black London’, which has served as often as the talisman of the politics of anti-racism, multiculturalism and cosmopolitanism in their many forms. This project, then, hopes to help us understand some of that connection between black London and black politics, and the cultures of democracy of modern British multiculture. So that’s the project, and welcome to the blog. I’ll be posting on here as I choose and set up the map that the project will be based around, and also as I begin populating that map, and inviting others to join me. So, if this interests you, please follow the blog for updates, and if you like, you can also follow me on Twitter, where I’ll announce any updates to the blog and the map. Posted on April 1, 2017 June 20, 2017 Tags James Procter, methods, Paul Gilroy, Stuart Hall5 Comments on Welcome to Black London Histories, 1958 – 1981.